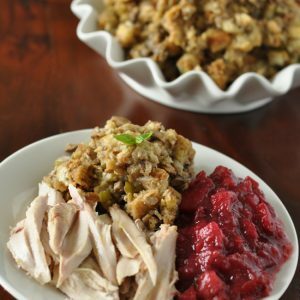 Oven Roasted Turkey Recipe: I will literally eat these for breakfast, lunch, and dinner until there’s not a scrap left in the fridge. It’s SO GOOD! Today’s post is sponsored by the lovely folks at Volk Enterprises and I love you guys to pieces for allowing me to occasionally work with brands I la-la-love to help pay the pile-o-blog-bills I’ve been raking up. All opinions are my own and this post was written entirely by yours truly. That being said, let’s get our turkey on! I’ll be the first to admit that Paul is officially the turkey tamer in this house. Any time he’s actually around for Thanksgiving, I put him to work seasoning, basting, and roasting the bird to perfection. I spent so many years as a vegetarian I just didn’t feel qualified for the job! Also? Hello terrifying! I could totally see myself reenacting that one episode of New Girl where they wind up thawing the turkey in the dryer. This explains why I spent our last deployment eating frozen pizza and binge-reading until the sun came up. Everyone kept calling/texting to ask if I was okay and surprisingly, I was. I really like pizza. No matter how much I may pine over pizza though, I love a good Thanksgiving dinner. In fact, this year I plan on having at least three. I overcompensate. I also really like leftover thanksgiving sandwiches and will do whatever it takes to get them. So back to my husband, the turkey handler. I jacked his technique, added my own spin on it since I was unsupervised and could run amok, and shall now ask that you don’t, under any circumstances, tell him that I know how to roast a bird. He’ll get lazy and make me do it every year while I much rather eat spinach dip and bug him while he does all the work. I also don’t want him to know how atrocious my carving skills are. It’s like watching a duck try to swim in jello; awkward for all parties involved. Now that I’ve diverged gloriously off topic, let’s get back to my new favorite new turkey timer! 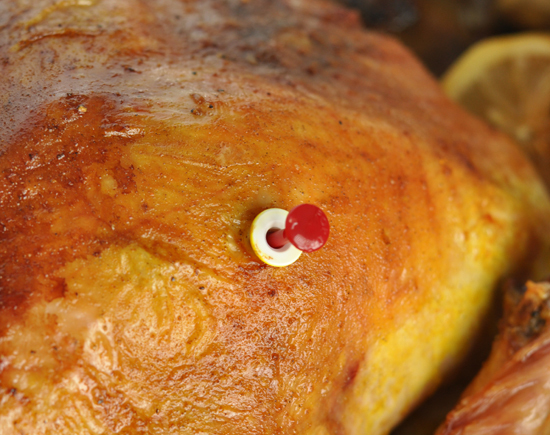 Did you guys know those little pop up timer’s on turkey’s are actually more accurate than a cooking thermometer?! I kid you not. Since cooking times are merely a guideline and, without some sort of temperature measurement you run the risk of an under or, more often than not, over cooked bird. When placed correctly, Volk’s Pop Up® Disposable Cooking Thermometer will tell you the precise moment your turkey reaches 180 degrees Fahrenheit so you can yank it from the oven without running the risk of a dry, sad dinner. Look for the registered Pop Up® name to make sure you’re getting the trusted brand and accuracy and enjoy not having to jab the turkey with a questionably calibrated thermometer numerous times through the cooking process. Phew! This was officially my first foray into turkey roasting, and you know what? It wasn’t so scary! Save for the carving; that may haunt me forever. The timer really did take out the guesswork and leave me with a delicious roast turkey that even my toddler deemed “dishhhous!” I’ll take it! Oven Roasted Turkey Recipe: I will literally eat these for breakfast, lunch, and dinner until there's not a scrap left in the fridge. It's SO GOOD! 1 frozen turkey (approx 10-15 pounds) with a Pop Up! For advance prep, defrost your turkey. With a little planning, this can be done in the fridge and takes about three days. It's also the safest method! Once your bird is good to go, pre-heat your oven to 35- degrees F.
Melt butter in a saucepan then add your olive oil and smashed garlic to infuse the butter. Saute briefly, then remove from heat to cool. This can also be done in the microwave if needed. 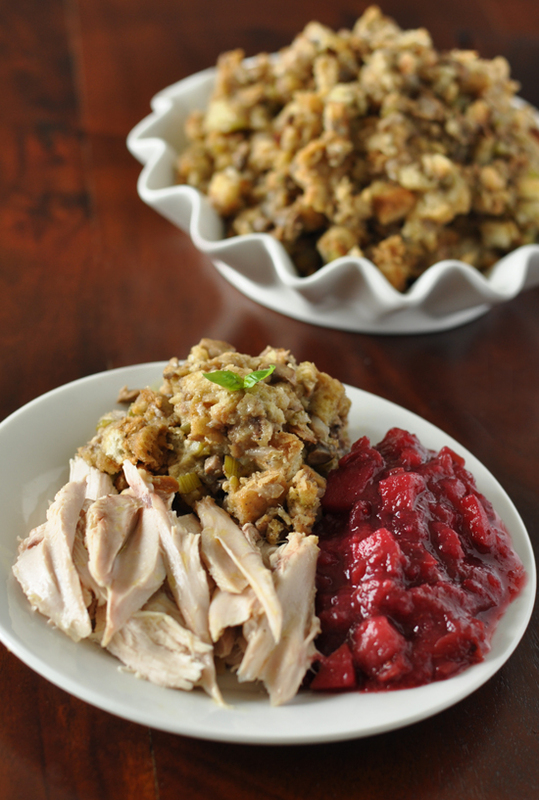 Remove all the "extras" such as the neck and giblets and place turkey in a roasting pan. Stuff + tie the legs with string or twine. Next sprinkle the bird with salt, pepper, garlic powder, thyme, garlic powder and turmeric and brush with your garlic butter mixture. Pour the remainder over the top and roast approx. 2.5 hours on the center rack. Since turkey roasting time is always an approximation, at the 2 hour mark, begin to watch the Pop Up timer. When the timer pops you're good to go! 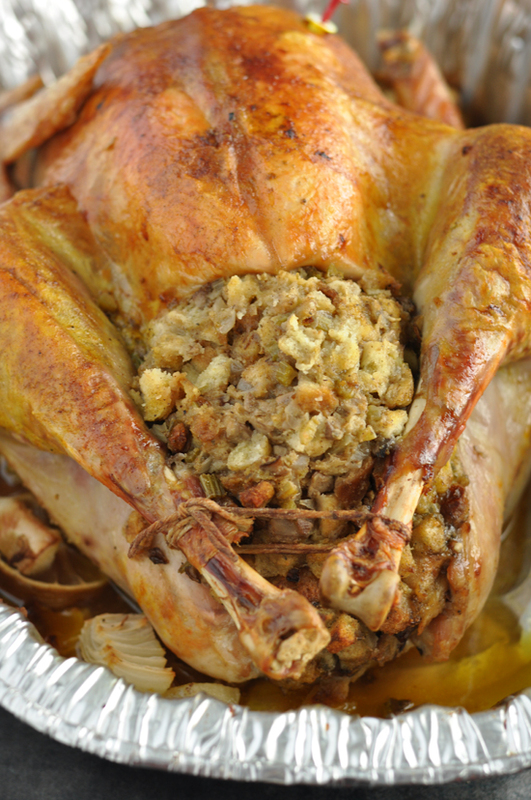 Remove your turkey from the oven, cover with aluminum foil, and allow to rest for 15-20 minutes. I've always and forever stuffed my turkey's with my mom's homemade stuffing recipe but if you're opting to roast your bird sans-stuffing feel free to fill it with extra aromatics instead. Onion, garlic, and herbs are always a great option with poultry! 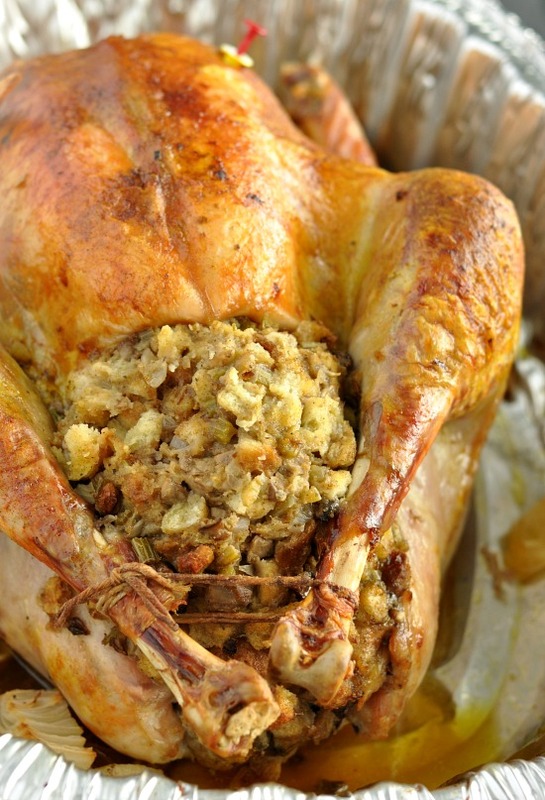 There’s even an awesome video on Turkey Prep 101, [click here] to check it out! This is where I nibble a little bit of the stuffing , some turkey thigh, and a bit of my new favorite cranberry sauce and package it all up for a sandwich making station of epic proportions. The following four days are heaven. I grab the fluffiest bakery bread I can find and slather it with fresh mayo, cranberry sauce, oven roasted turkey, and stuffing. It’s beyond simple and my absolute favorite sandwich in the history of ever. My mom has been making these for me my entire childhood and now I’m in charge of whipping up this nostalgia for my own family. Just typing this up has me anxious for Thanksgiving so I can make more! I will literally eat these for breakfast, lunch, and dinner until there’s not a scrap left in the fridge. Then I pine and pout away until it’s time to do it all over again! For more turkey shenanigans check out Volk Enterprises on Twitter or Pinterest and stay tuned for more yummy holiday recipes. I’m not nearly done with my cranberry craze and I think a few healthy veg-tastic side dishes are in order, no?